It is the belief of many that corrosion is an inevitable foe that should be accepted as an inevitable process. Actually, something can and should be done to prolong the life of metallic structures and components exposed to the environments. As products and manufacturing processes have become more complex and the penalties of failures from corrosion, including safety hazards and interruptions in plant operations, have become more costly and more specifically recognized, the attention that is being given to the control and prevention of corrosion has increased. Since the first significant report by Uhlig in 1949 that the cost of corrosion to nations is indeed great , the conclusion of all subsequent studies has been that corrosion represents a constant charge to a nation's gross national product (GNP). The annual cost of corrosion to the United States was estimated in Uhlig’s report to be $5.5 billion or 2.1 percent of the 1949 GNP.This study attempted to measure the total costs associated to corroding components by summing up the cost for both the owner and operator (direct cost) and for the users (indirect cost). Costs where savings required new and advanced technology (currently unavoidable costs). Estimates of avoidable corrosion costs in these studies have varied widely with a range from 10 to 40 percent of the total cost.Most studies have categorized corrosion costs according to industrial sectors or to types of corrosion control products and services. All studies have focused on direct costs even if it has been estimated that indirect costs due to corrosion damage were often significantly greater than direct costs. Indirect costs have been typically excluded from these studies simply because they are more difficult to estimate. The opportunity for large savings through more cost-effective use of currently available means to reduce corrosion. The most recent study resulted from discussions between NACE International representatives, members of the U.S. Congress, and the Department of Transportation (DOT). An amendment for the cost of corrosion was included in the Transportation Equity Act for the 21st Century, which was passed by the U.S. legislature in 1998.The amendment requested that a study be conducted in conjunction with an interdisciplinary team of experts from the fields of metallurgy, chemistry, economics, and others, as appropriate. Two different approaches were taken in the ensuing study to estimate the cost of corrosion.The first approach followed a method where the cost was determined by summing the costs for corrosion control methods and contract services.The costs of materials were obtained from various sources, such as the U.S. Department of Commerce Census Bureau, existing industrial surveys, trade organizations, industry groups, and individual companies. Data on corrosion control services, such as engineering services, research and testing, and education and training, were obtained primarily from trade organizations, educational institutions, and individual experts.These services included only contract services and not service personnel within the owner/operator companies. The second approach followed a method where the cost of corrosion was first determined for specific industry sectors and then extrapolated to calculate a national total corrosion cost.Data collection for the sector-specific analyses differed significantly from sector to sector, depending on the availability of data and the form in which data were available.In order to determine the annual corrosion costs for the reference year of 1998, data were obtained for various years in the surrounding decade, but mainly for the years 1996 to 1999. The total cost due to the impact of corrosion for the individual economic sectors was 137.9 billion dollars per year in the following Table. Explain what are the main differences between direct and indirect costs associated to corrosion damage. Provide some examples from your own experience. 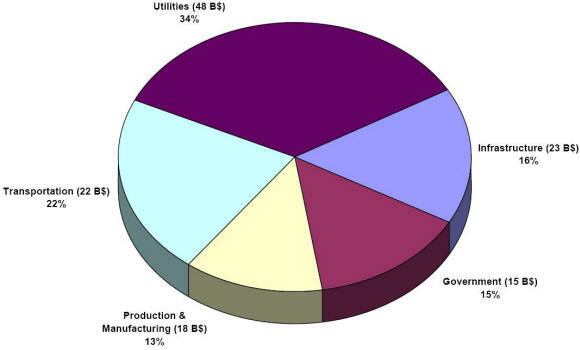 A breakdown of these costs by individual sectors is shown in the following Figure. Since not all economic sectors were examined, the sum of the estimated costs for the analyzed sectors did not represent the total cost of corrosion for the entire U.S. economy. 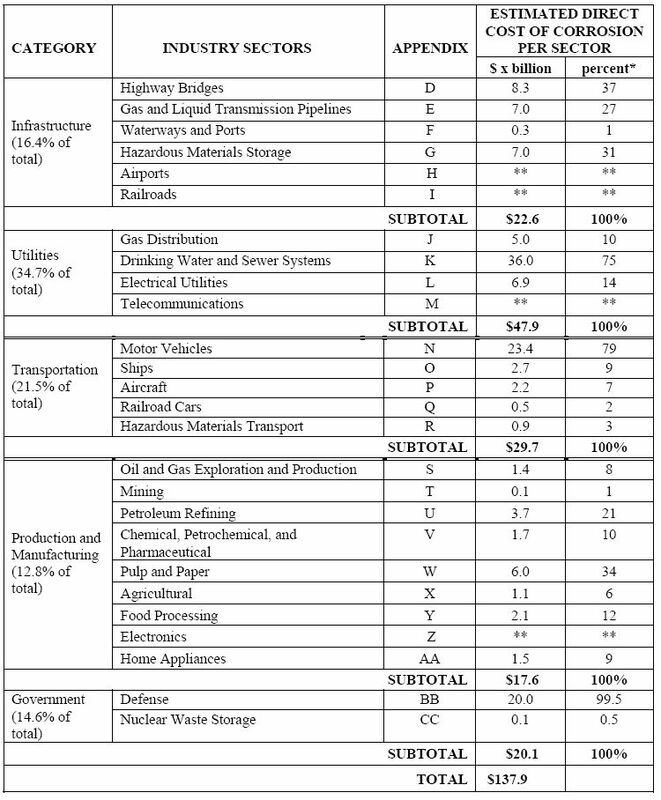 By estimating the percentage of U.S. gross national product (GNP) for the sectors for which corrosion costs were determined and by extrapolating the figures to the entire U.S. economy, a total cost of corrosion of 276 billion dollars was estimated.This value shows that the impact of corrosion is approximately 3.1 percent of United States’ GNP. This cost is considered to be a conservative estimate since only well-documented costs were used in the study. The indirect cost of corrosion was conservatively estimated to be equal to the direct cost, giving a total direct plus indirect cost of 552 billion dollars or 6% of the GNP.